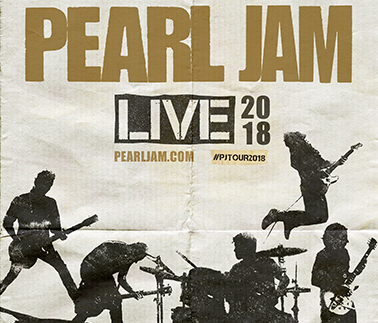 Pearl Jam - Summer 2018 Tour — Loud! Noises! Pearl Jam will embark on a fourteen-date European tour in June and July of 2018 including two shows at the O2 Arena June 18th and 19th. October 22, 2015 officially marked 25 years of Pearl Jam performing live. Ten studio albums, hundreds of unique live performances and official live concert bootleg releases later, the band continues to be critically acclaimed and commercially successful, with over 85 million albums sold worldwide and a 2017 induction into the Rock and Roll Hall of Fame. The band’s summer tour kicks off on June 12th in Amsterdam, NL and wraps up on July 14th in Lisbon, PT. This tour marks the band’s first performance in Rome since 1996 and first ever concerts in Padova, IT and Kraków, PL. A special ticket pre-sale begins today for current Pearl Jam Ten Club members. General public tickets for the O2 Arena go on sale Friday, December 8th at 11AM. Check pearljam.com for updates. In celebration of Pearl Jam's legendary, sold out performances at Wrigley Field during the Chicago Cubs historic World Series championship season, Pearl Jam recently released documentary film Let’s Play Two and accompanying soundtrack album. Full details at www.letsplaytwofilm.com.